Getting fitted for these looks very unpleasant. Eventually nearly everyone mill wear their glasses on their eyeball. ONE of the lesser miracles of science is the contact lens, that invisible eyeglass that fits right on the eyeball to correct imperfect vision. Now science improves on its miracle and makes the lens out of plastic, eliminating glass and its breakage and giving new lightness and improvement in appearance. A few people can’t wear contacts because of hypersensitivity, but most can wear them for an hour or so at first and gradually increase the period up to eight or ten. The lens doesn’t really touch the eyeball. A saline solution placed in it before it is inserted serves to lubricate the eyeball and keep the two from actual contact. Some day spectacles will be seen only in museums. 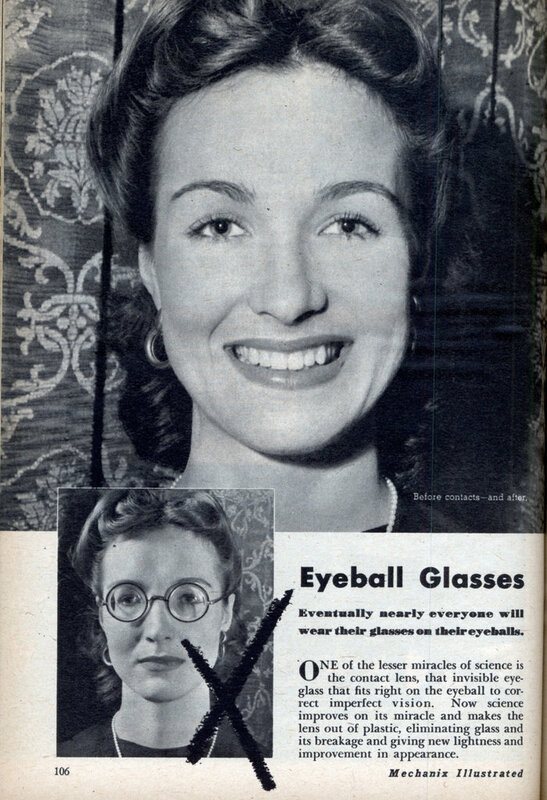 My mother told me that my grandfather had contacts like these; she said they were horribly uncomfortable. These things are still made they are called scleral shells. They are fitted to an eye that has been deformed by injury or disease in order to give it a more normal appearance.